Slumber parties aren't just for squealing teenage girls. Adults can host a slumber party, too. Sleep overs are a great way to reenact wonderful memories of youth or to just relieve some stress from an overbooked life. An adult slumber party host or hostess has some unique challenges that don't have to be considered while planning your average get-together. Guest list - If you are going to invite guests of both genders, you will have to address a few issues such as offering two separate sleeping areas, providing extra dressing room space and an extra mirror, too, for a less stressful morning. You should also ask guests to wear appropriate sleepwear. If you are inviting someone who is in a long-term relationship, you should be sure to invite their significant other if you are having a co-ed party. Date - When choosing a date, keep your guests' work schedules, as well as your housemates' in mind. Consider having the party on Friday or Saturday night so those with traditional school and work schedules will have the next day off. Also, remember that guests who have children will need plenty of advance notice to arrange for over-night childcare. 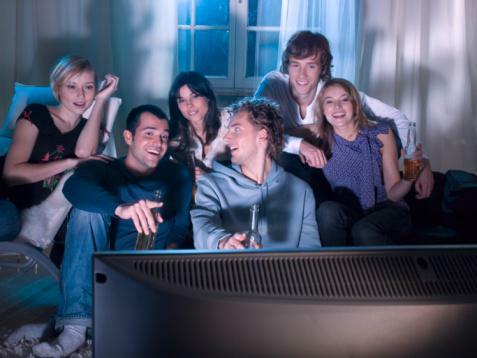 Location - Having the party at home is an obvious choice, but for those who have a small house or housemates who might not want to have a party, this could be a challenge. Consider holding your party at a local hotel, campground or your own backyard. If you are feeling adventurous, find a nice mountain cabin or a condo on a beach to hold your party. Invitations - There are a variety of options for slumber party invitations, including a simple email and store-bought invitations. You might also want to hand-make some invitations or simply just call your circle of friends with a verbal invitation. Choosing a theme for a party can be fun, and can help the host or hostess make other decisions such as the color scheme and what types of snacks to serve. In fact, you could even borrow theme ideas from children's slumber party themes and put an adult spin on them, such as a spa or game night theme; other party themes can easily be adapted for a slumber party, too. Everyone likes to be treated as if they were rich and famous, even if it is for one night. Rent a projector, screen, and a stack of favorite or classic movies for an evening of fun. Roll-out the red carpet, or at the least, a roll of large red paper for guests to walk on when they enter the party venue. 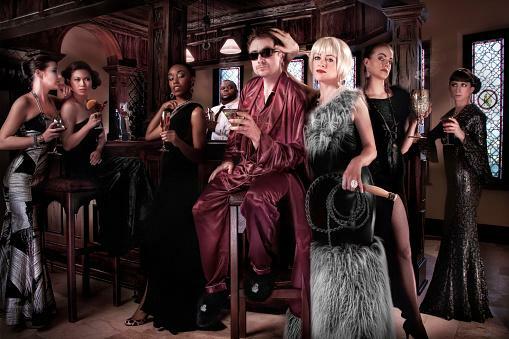 This is also a great idea if you want to host a fancy party - ask everyone to show up in their finest Hollywood styles - and don't forget the photo booth! Be sure to provide popcorn, candy, sodas, slushies, and various other snacks for guests to enjoy. Provide guests with glow sticks which can be purchased at the local dollar store. Set-up black lights and give each guest a plain white T-shirt and some neon or glow-in-the-dark fabric paint that they can use to decorate it. Crank-up the music and a few low lights for safety reasons and let the glow-in-the-dark dance party begin. Turn your fun event into a meaningful experience. Buy supplies for various different craft projects and ask guests to create useful or decorative items that can be sold to raise money for charity or that can be donated to those in need. Crafts that could be sold to raise money include beaded jewelry and painted pottery items. Knitted scarves, mittens, and blankets can be donated to homeless shelters or organizations who help the needy. Tired of social media and the electronics leash? Invite your well-connected friends to unplug for the night. Collect all phones, laptops and tablets at the beginning of the night and ask guests to refrain from taking them back throughout the night. Have plenty of "old-fashioned" fun available so they won't even miss their night without their phones. Board games and drinking or party games will help take their minds off all the social media opportunities they are missing. Have digital cameras available to capture the fun (without having to grab a phone) and some alarm clocks too, so guests won't rely on their phones to wake them. Provide a land-line number so guests can give it to their families or roommates in case of emergency. Be sure to email or send photos via Facebook after the party to help guests remember the fun. Invite single friends of both genders to your mixer party. Provide a lot of quiet corners for guests to talk, music and a place to dance and some fun "get to know you" games. As the night grows late, provide separate sleeping quarters for male and female guests. You might just be responsible for introducing your best friend to her new boyfriend. Provide a few organized activities for the next day in case couples want to spend the day together. Activities might include taking a group to an art museum, ball game, or a local tourist attraction. Cheerio, Ole Chap!! Celebrate all things British with all your favorite mates. 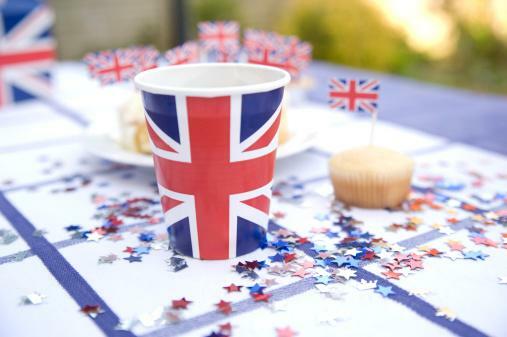 Decorate your party area with British flags, double decker bus images and lots of red and blue balloons. Serve tea, fish and chips, and Yorkshire pudding. Play your favorite British comedies throughout the night. Be sure to teach your guests how to wave and act like royalty and award a prize to the person with the best British accent (or the one who remembers to use their accent the longest). Set a clock to Great Britain's time zone (either Greenwich Mean Time or British Summer Time) and eat dinner and go to bed based on their time zone. So what if you're eating dinner when all your American friends are in bed? The internet is full of interesting (and sometimes weird) challenges, fads and trends. Gather a group of friends together and spend the night attempting one of these challenges after another. Take photos of each other planking or a video of pulling a safe prank on someone. Some safe challenges include Try Not to Laugh, Whisper, or Mannequin Challenge. Of course, you will want to avoid any of the many challenges that could put you, your guests, or property in danger. Some challenges need ingredients or supplies, so be sure to pick a few of your favorites and be prepared. Have some typical party foods, but also include some popular "Eat It or Wear It" Challenge goods. This popular challenge asks players if they want to eat or wear such foods as Jello, spaghetti or fish. For decorations, put the popular social media logos on large poster boards and hang them around the venue and use fun emoji decorations. Oh, doesn't everyone love their "Netflix and Chill" nights? Share a night of your favorite Netflix shows and some good eats with your best friends. Ask everyone to come in their pajamas or lounge clothes. Provide popular snack foods like theater candy, pizza, and popcorn. Get ahold of the largest television you can and make sure you have enough lounging areas around the television. When you're choosing the films to watch, ask guests to vote amongst your favorites or have a playlist already figured out. Have a few games available if guests get bored with watching movies. The main activity for the night is just hanging out with friends in a nice, relaxed atmosphere. If you choose not to have any particular theme for your party, consider decorating with slumber and sleep-related items. Buy or make large pillows and provide warm blankets and throws for guests to get cozy on sofas or lounge chairs. Put out fluffy plush rugs for friends to lounge on with their pillows and blankets. Select a color scheme such as gold, pastels, or black and white. Use this color scheme to guide you as your purchase basic party supplies. Use fresh flowers, balloons, and streamers to help liven up the party area. Light the entire party space with nightlights; put them along the floor and in higher outlets along the walls and countertops. If you're outdoors, hang up paper lanterns with LED candles. Essential oil diffusers often come in sophisticated designs; some even have mood lighting. Set a few up throughout your party space with some calming and relaxing oils in them. Depending on the start and end times for your party, you could potentially have to provide for three different meals, plus snacks for the guests. Before creating the menu, consider any dietary restrictions for guests. Some guests may be diabetic, gluten-intolerant or have an allergy to peanuts or another type of food. It is best to ask guests about these restrictions before the party to avoid any trouble on party day. Theme-appropriate foods can help tie the party together, as well, so keep that in mind if you've chosen a specific theme. If you have it in your budget, think about hiring a food truck to arrive around dinner time. You can find ones that specialize in burgers or have Mexican or Greek foods. In fact, you could even hire one to arrive with donuts and cookies around midnight for a late-night snack for everyone to enjoy at the party! Just ask your favorite one if they are available to hire. If guests arrive around dinner time, you'll have to provide a meal for them. 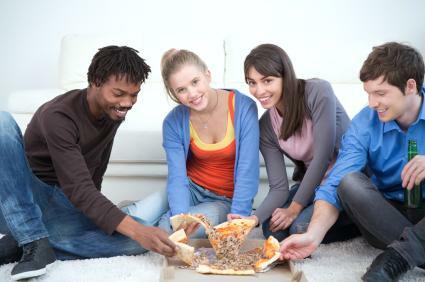 Pizza is always a good choice, as most people enjoy it, it is inexpensive, and can be delivered. You may also want to have a barbecue or picnic outdoors, or ask guests to contribute to a potluck. There are a variety of different ways to serve breakfast to slumber party guests. A continental breakfast is an easy option and might include something simple like donuts, yogurt, and fruit. You can get this ready before guests arrive. Put everything in colorful bowls and store in the fridge or pantry until it's time to pull them out. 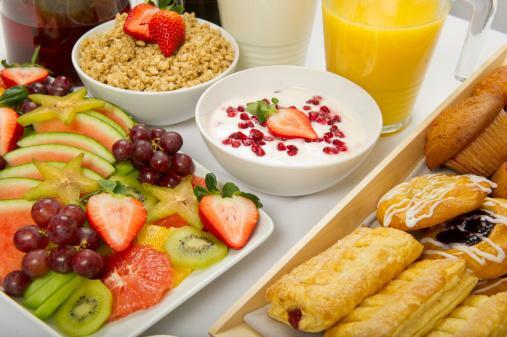 A breakfast buffet with scrambled or hard boiled eggs, pastries, potatoes, and sausage or bacon is another option. Use a few slow cookers to keep things warm for guests. An omelet bar is also a fun way to provide breakfast. This works well if you have an open kitchen with an island cooktop - guests can watch you flip the omelets as you make them! Cereal is also an easy breakfast that most people will enjoy. Have a couple of different milk options (2% and skim) and a variety of individual serving sized boxes of cereals for guests to choose from. Use plastic spoons and disposable plates for easy clean-up. Have plenty of bottled water on hand to help keep guests hydrated throughout the evening. Also have some cans of various types of pop. Alcoholic beverages, like a wine and vodka punch, might make the evening more enjoyable for folks, but be sure to verify that all guests are of legal drinking age. Coffee and orange juice will help complete the breakfast menu. Be sure to have milk on hand too. Someone might want warm milk to put them to sleep or a glass of milk with late night cookies. You will also need milk if you are planning on serving cereal in the morning. Keep guests busy and entertained with a variety of activities. There are plenty of things to do at a slumber party, from setting up a fun photo booth to dancing. Sleep over games are also a great choice, and they can range from classics like Truth or Dare to board games. If you want to make your party even more memorable, engage in a few harmless pranks. Just be sure you aren't causing anyone stress or harm. If you have a theme for your party, use it as inspiration for party activities too. For instance, if you are hosting a Hollywood party, consider hiring a limousine for a quick tour around town. It's nice to provide guests with small gifts which help them to feel special and give them something to take home to help them remember the party. Slumber party related items such as slippers, pillow cases, or nightcaps are appropriate favors for any slumber party. 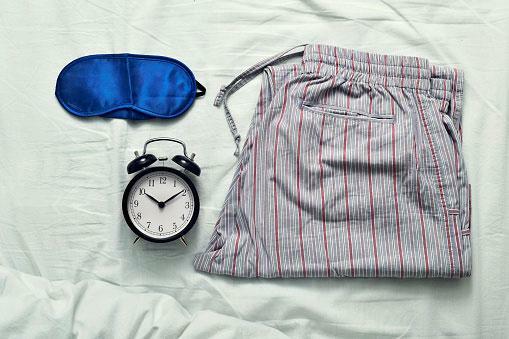 Soft socks and sleep masks are also appropriate. Toothbrushes, toothpaste, and any other personal hygiene item can also be used. A small container full of snacks for guests will also help to ward-off midnight munchies. Be sure to include a bottle of water. Favors can also be theme-related items, like a movie rental ticket for Hollywood night. Planning an adult slumber party can be a lot of fun, but can also require a lot of planning and consideration. With some strategic organization, it can be stress-free.